Instructions on installation: Please visit “How To Install A Buds Helmet Mirror” On “YouTube” for my popular videos. Almost all questions answered! All of my pictures and videos, the music, editing, and this website are made by me unless noted, No slick professional ads or models are used. 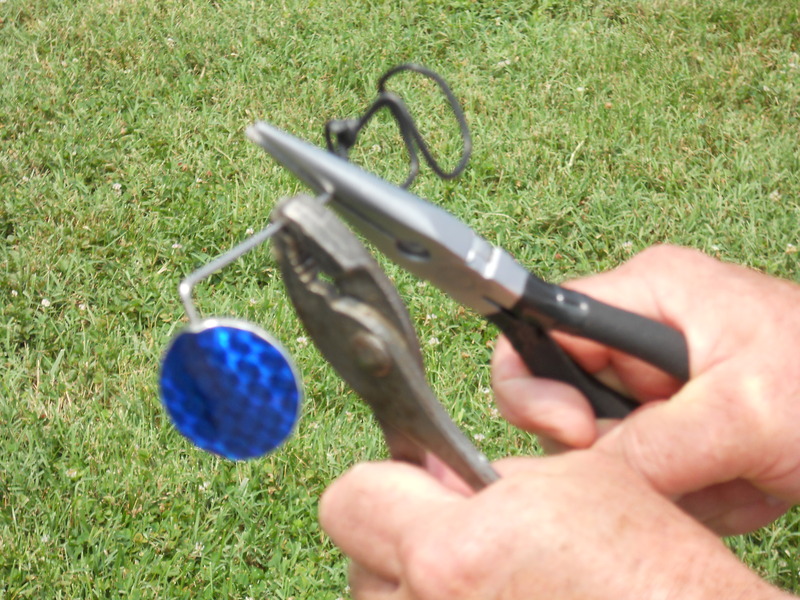 Adjust VIEWING ANGLE by bending metal spoke using two pairs of pliers or strong fingers. Bend the spoke, not the connection point. DO NOT attempt to bend the spoke by holding the mirror, as that action will break the superlight mirror! Proper adjustment: you should be able to see your finger on your left ear (and therefore see a car behind you) without turning your head, but simply by shifting your eye. If the mirror becomes too loose, screw it in GENTLY, a little more (one turn), or unscrew it a few turns and put a small drop of Elmer’s or similar glue on the threads, screw it back together and let dry before using again. Caution, If you screw it down too far, it will separate and delaminate. This mirror should last several seasons with proper care. One of my testers used one for 10,000 miles with no problems. This mirror is guaranteed not to de-silver for 90 days after purchase. Sorry this product is not replaced free if lost or dropped, but contact me for a good customer reward. budshelmetmirrors@gmail.com. This glass mirror is breakable, and not intended for children’s use. Obviously, Do not drop, or step on! Cable Tie. Simply find your favorite mounting spot and wrap the tie around and thru the helmet vent and spoke. Careful to aim the closure outward so you can remove and reuse the tie. This is a premium Gardner Bender cable tie-UV resistant! This product is “wearable art”, it is made of glass and is breakable and therefore could cause injury if misused. It is intended to aid in safe Bicycle riding by allowing the user to see traffic behind them. There is no guarantee of this because it’s effectiveness is determined by the skill of the owner/user. Cycling is an assumed risk sport. Get a bike handling training course. Practice using the mirror before riding. NEVER try to adjust the mirror while riding!. THIS PRODUCT IS NOT A TOY AND NOT SOLD TO CHILDREN AND IS NOT FOR CHILDRENS USE.